Photolalia: Castro Street -- Some images... and a few brief words about them. (Oakland, 2008; click on image for larger version. Image copyright Hamish Reid). 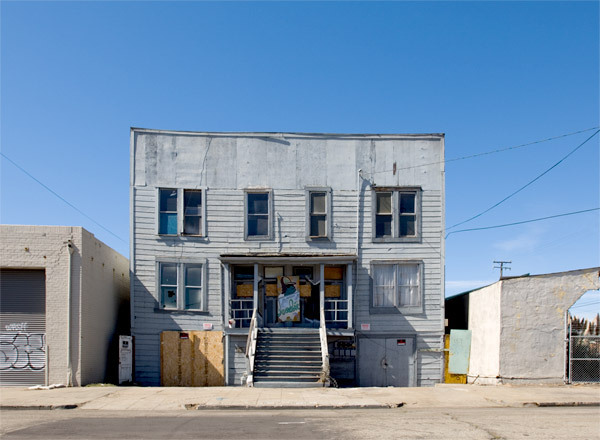 For several years I commuted into San Francisco from my studio and home in East Oakland on BART; as you went over West Oakland on the elevated BART way, you could see this ramshackle old apartment building just off to the left at street level in a mostly commercial and industrial neighbourhood. Over the years it got progressively more decrepit until it looked like it must have been condemned; but these things are hard to tell from BART. I kept mentally making a note to go and photograph the place, and every now and then I'd actually ride or drive past it on my way through West Oakland, but the sun was always in the wrong place or the light was bad or (as always seems to happen in West Oakland) there'd be a huge container truck or something similar parked idling right in front of it.